We had the unique opportunity to visit what I believe to be the most beautiful place I’ve ever visited in my entire life in March of 2017. It’s an area of land that has been owned and managed by the Havasupai American Indian tribe for the last 800 years known as Havasu Falls. 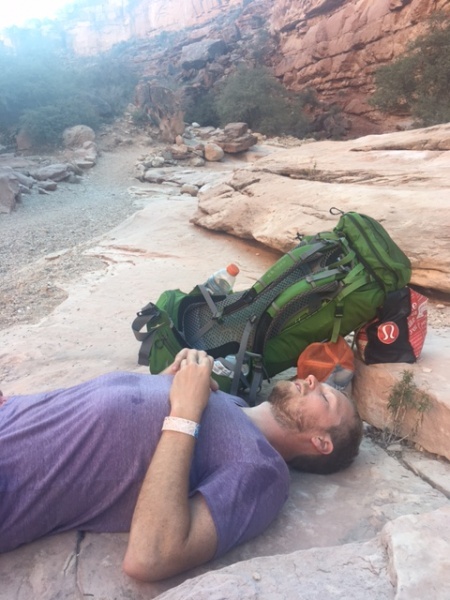 Prior to our visit Nick complained about the serious lack of information about getting a permit for Havasu Falls on the official Havasupai Tribe website so I promised him I would write an incredibly detailed (and hopefully helpful) post. We hope you enjoy! Note: The reservation process has gotten significantly easier since 2017, lucky you! Read our post outlining all of the changes here. 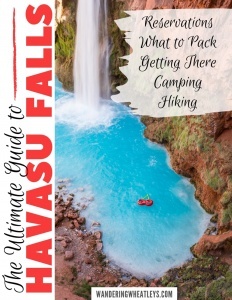 We published a 2019 Havasu Falls: Permit, Hiking, and Camping Guide. 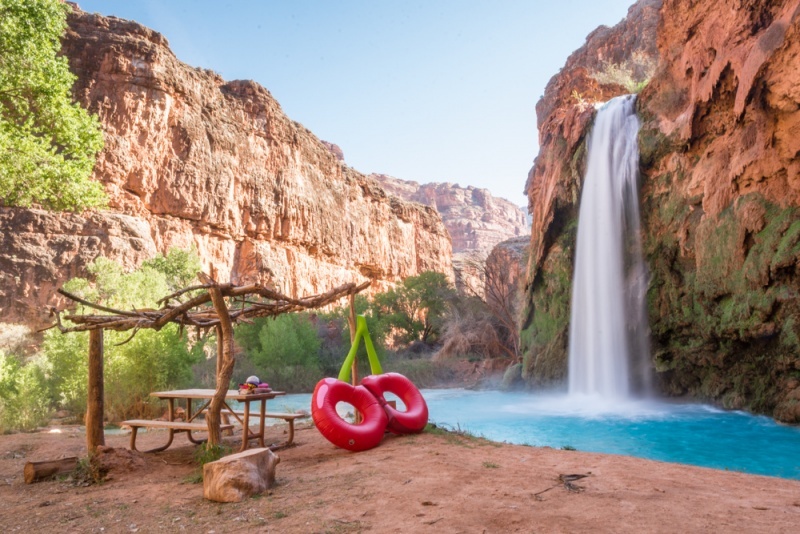 We recommend reading that post for all of the most up-to-date Havasu Falls pricing and reservation information! 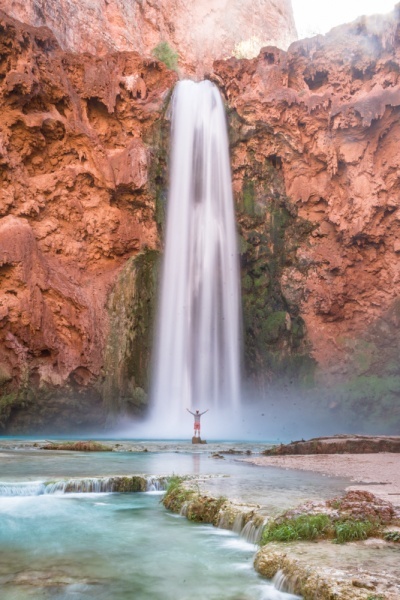 What Should I do all Day at Havasu Falls? Havasu Falls permits become available on February 1st at 8:00am Arizona Time and most of the permits for the upcoming 9-month season are booked up in the first week or so. You’ll need to book directly through their online reservation system. When we booked our permits in 2017 we had to dial 3 phone numbers over and over again until someone would finally pick up. Now they actually ask that you NOT call their office at all unless you have a customer service issue. 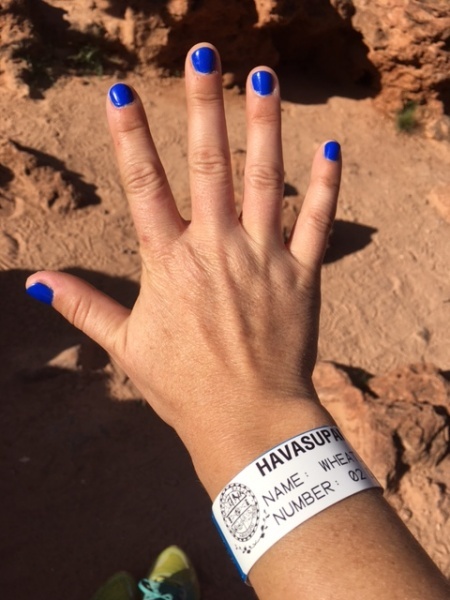 January 8, 2019: Starting in 2019 you’ll need to create an account on the Havasu Falls Reservation site. You can begin doing this on January 8th. 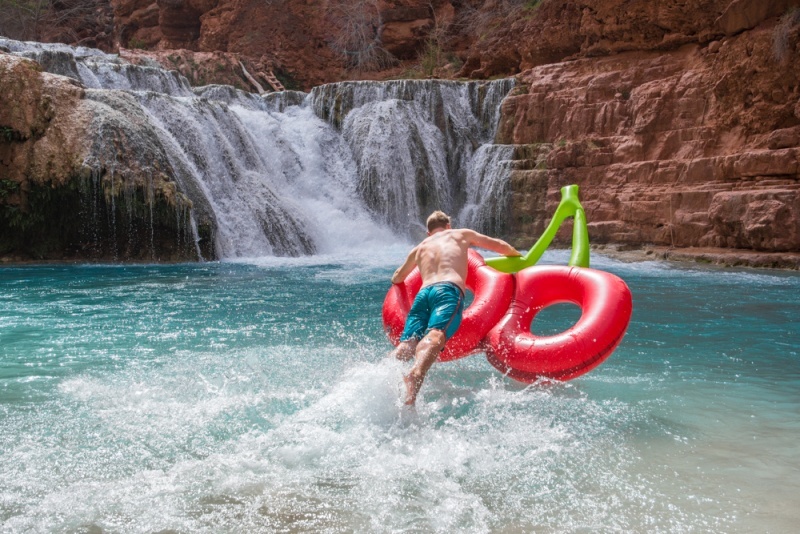 February 1, 2019: This is the day Havasu Falls permits go on sale for the entire 9-month season. 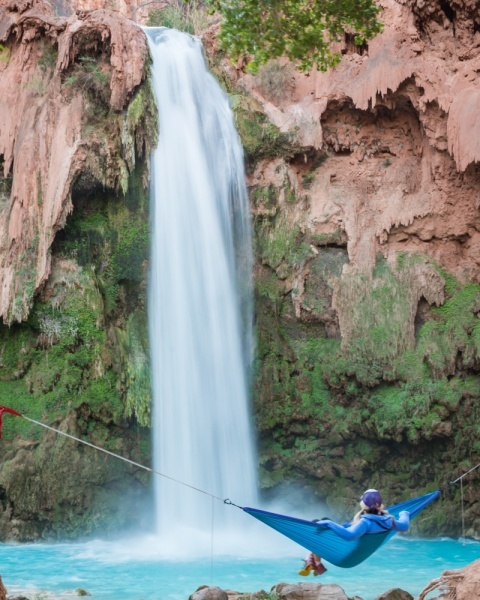 Make sure you log onto the reservation site promptly at 8am Arizona time to give yourself the best odds of getting a permit to camp at Havasu Falls. Rumor has it that they sell around 300 permits per day in low season and 400 in the high season and weekends are obviously more popular than weekdays. Beginning in 2019, all campground reservations will be for 3 nights/4 days according to the reservation website. Honestly, we didn’t come across any outlandish rules other than “no alcohol”. What?!? Apparently they have an issue with alcoholism among the locals so they don’t want it anywhere near them. We heard a nasty rumor that they may come by your campsite in the evening hours to inspect your drink but we never encountered anyone and we were most certainly drinking our boxed wine every night (SHAME ON US!). 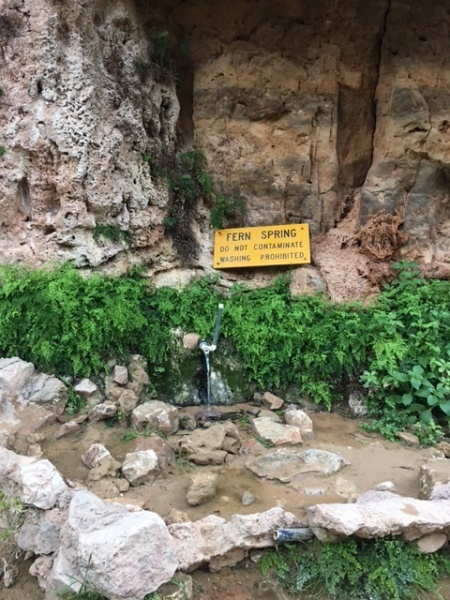 From the Havasupai parking area, it is approximately 8 miles to the village and then an additional 2 miles to Havasu Falls and to the start of the campground. There are several options for getting there; you can hike-in with all of your gear, you can hike-in and hire a horse to carry your gear for you, or you can take a helicopter ride. Our original plan was to hike-in our gear but as we were gathering our belongings at 8:30am to start our hike we met a saint of a man who had paid the $120 to hire a horse but was only using 2 of the 4 allotted bag spots (the horses can carry up to 4 bags and/or 130 pounds). He offered us a deal we couldn’t refuse and we scrambled to throw stuff in smaller day hiking bags before taking off. The moral of that story is it’s worth talking to people when you arrive to see if you can strike the same deal! 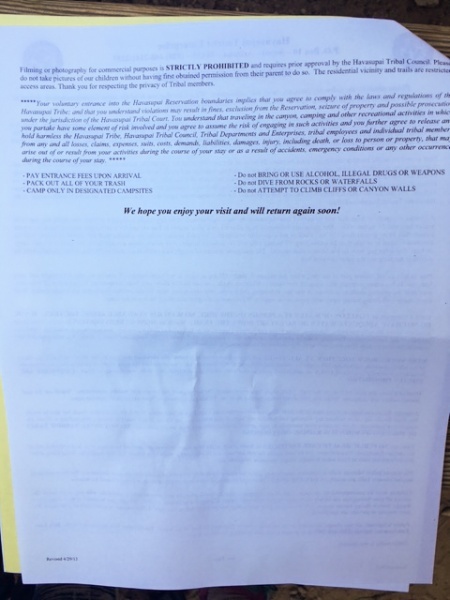 The helicopter ride is offered for $85/person but in speaking with a lady who took that option, it sounds like you are only allowed one bag per person and are charged an additional cost per pound for bags weighing more than the allotted amount. We also heard that you have to get to the helicopter line early or you’ll end up waiting for hours. Locals get priority and apparently Thursday is payday so they all go to town to cash their checks. As we were hiking out we saw loads of people waiting in line to get out and it didn’t look fun. We also saw a few people riding horses out of the canyon when we were hiking in but I didn’t meet anyone who did it and I have no idea what the cost would be. They all looked miserable (but probably not nearly as miserable as we did when we had to hike out). From the parking lot, there is a 1.5-ish mile descent into the canyon via switchbacks. This is super fun and easy on the way there and sooooo miserable on the way out. Especially while carrying a 30-pound pack (why didn’t a saintly man offer us a killer horse deal on the way out?). The rest of the hike is through the canyon wash so it is fairly flat the entire way. Once you get through the town you begin to see some epic waterfalls and swimming holes. 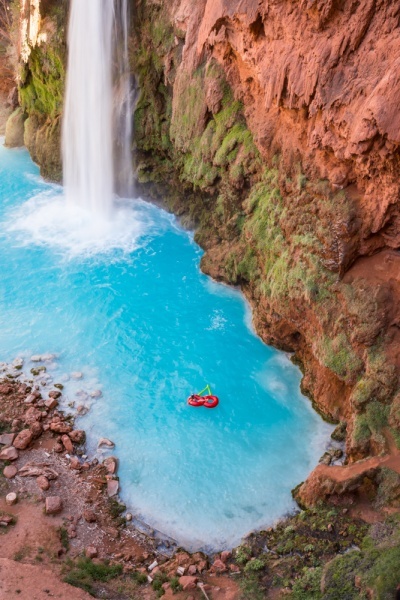 It is very tempting to say “oh let’s go on to Havasu Falls and come back later”. Trust me, you won’t. It’s so worth the stop, both on the way there and on your way back out. 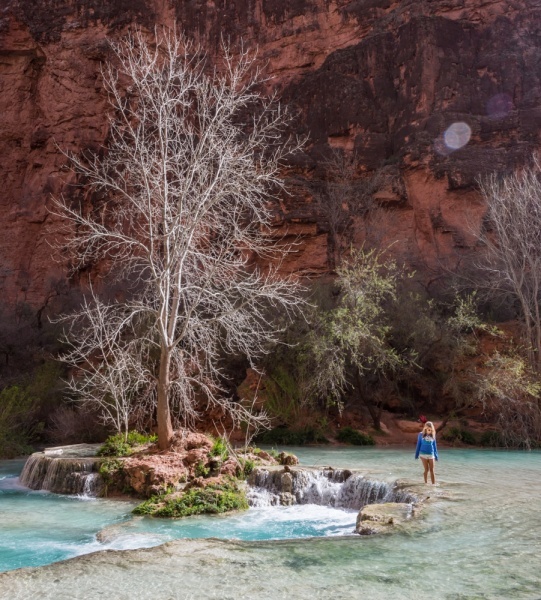 Once you’re at Havasu Falls it’s pretty unlikely you’ll want to head back to town (unless you need food or are staying at the lodge). It is BEAUTIFUL and sunny at the top of Little Navajo Falls (Havasu Falls only got sun from about 11am-2pm while we were there and we figured that Mooney Falls never got any sunshine) so it is definitely worth the stop to soak in the rays. It seems most people choose to start their hike out of the canyon on their last day early in the morning (around 5am) before the heat of the day. We actually opted to enjoy our morning coffee in our hammock and then stop for a swim at the top of Little Navajo Falls for another few hours and then start our hike out at around 3:30pm. This is where I was confused at first. I was under the impression that these were completely separate trails and that each was it’s own day hike. That is incorrect. You actually have to hike through Mooney to get to Beaver Falls so most people do both in one day (if you do, you should definitely leave early in the am to get ample time at each). The campsites are all between Havasu and Mooney (in fact, there were several people camped at the very top of Mooney) and the two falls are less than a mile from each other. And Beaver Falls is about another 2.3 miles one-way from Mooney. But be forewarned, the hike down to Mooney Falls is not for the faint of heart. You must climb down a sheer cliff wall using ladders and chains for most of the way. And it’s muddy and slippery from the waterfall mist. BUT once you get to the bottom you’ll know that it was all worth it. And it’s not as crazy as it feels at the time; there are chains to hold on to and hundreds of people (and children) do it everyday. Plus you can’t possibly have gone through all of this work to get to Havasu Falls and NOT see this part of the canyon. 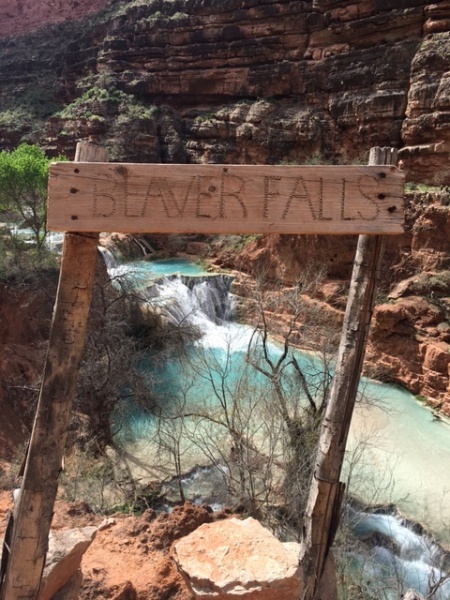 The hike from Mooney Falls to Beaver Falls is fairly flat and easy enough. There are 3 river crossings which we did barefoot (although water shoes would be recommended) and a few ladders to climb but nothing that was overly difficult. We would highly recommend taking this day trip as the hike is lovely and Beaver Falls is absolutely spectacular! 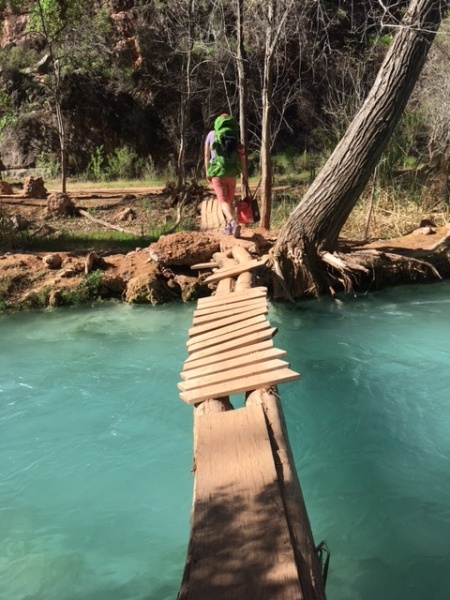 The Havasupai tribe forbid day hiking and you’ll need a reservation for the campsite or the lodge to stay the night. Thinking of sneaking in? We were checked 4 times during our 4 days at the falls. The first was in the parking lot. A lady sitting in her car has a list of the names of all registered campers. Second, we were asked for our name by a random man on a horse during our hike to the village. He wrote it on a tiny pad of paper. Not sure exactly how he confirmed our reservation or what he would have done if he found out we didn’t have one. We then checked-in at the Tourist Office in the village. This was the only place that we were asked for ID and only Nick was asked to provide photo ID because he was our “party leader” (you chose who is the party leader when you make the reservation). We were then each given a wristband and a tag to attach to the outside of our tent. Lastly we came across a man waiting at the top of Beaver Falls who checked our wristbands and asked for our names. We chatted with him for a bit and I asked him about catching people sneaking in. He said a fair amount of people take a boat in from the Colorado River and then hike up the canyon which is about 4-ish miles to Beaver Falls. 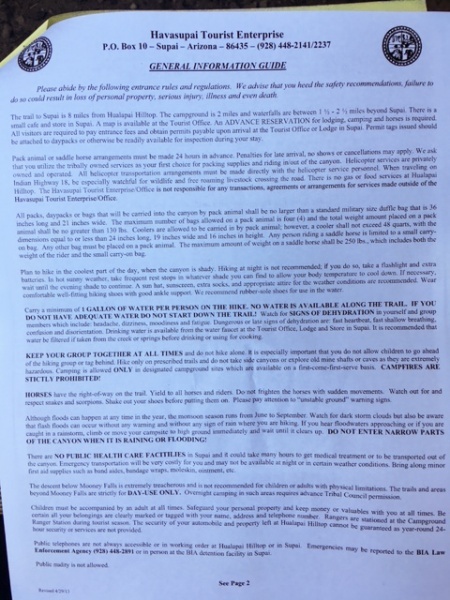 I asked about what the penalty is for those folks and he said that they are either asked to turn back, or to stay on the Grand Canyon side (which is right below Beaver Falls), or they are just required to pay the entrance fee of ~$75. Nothing too serious. He seemed friendly and talkative and certainly not out to get anyone. There are disgusting, horrifying port-o-potties at the trailhead parking lot as well as 3 decent compost toilets. There are no toilets along the canyon trail. 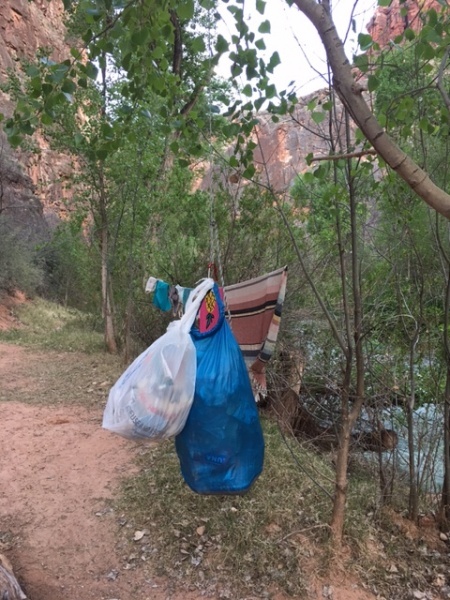 We did not take a look at the Havasupai Lodge but we heard from a woman who was staying there that they were super basic – no microwave, no refrigerator, and no tv (why would you need a tv in paradise?). But she said there were a few hibachis for cooking. 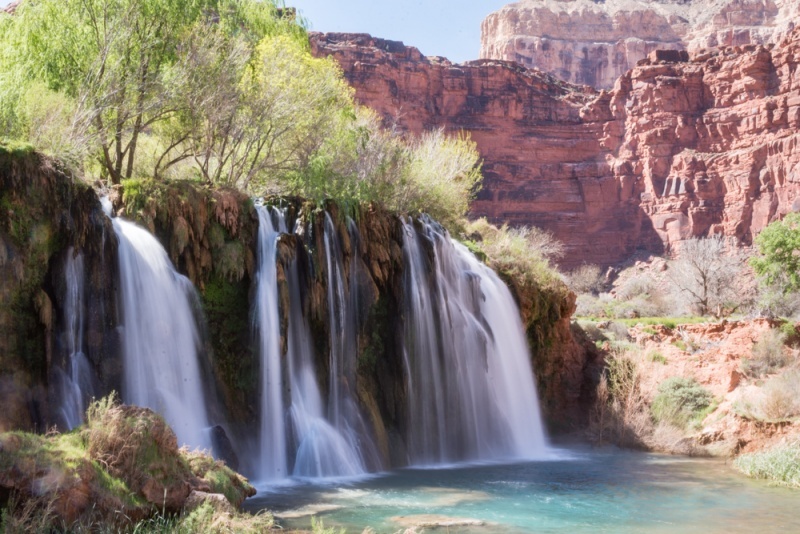 If you choose to stay at the lodge, be aware that it is located in the village which is 2 miles from Havasu Falls. So that adds an additional 4 miles roundtrip to any adventure you choose for the day. Beaver Falls becomes a 9 mile round-trip trek as opposed to the 5 miles that we walked from the campground. There are 2 restaurants in the village, 2 grocery stores, and 1 post office. We ate at the restaurant that was just outside of the village on our way out, we had the Supai Cheeseburger and the Grande Nachos. Both were awesome. They also sell fry bread, hot dogs, and tacos at the entrance to the campground. The campsites are first come, first served which I was rather concerned about on our hike in. I figured we would be late and be stuck by the stinky bathrooms. Turns out there is plenty of room for everyone, so no reason to fret. We chose a spot across the river so we had to cross a pretty sketchy bridge at least twice daily but it was worth it to avoid being right next to the trail. The campsite was really large and we put some inconspicuous gear on the picnic table one campsite over to look like people were considering camping there so we not only had amazing views but also plenty of privacy (again, shame on us!). We did hear that during peak season, people are so packed in that they have to pitch their tent in the middle of the trail. But really, who cares? You don’t need to hang out there when you’re surrounded by so much beauty. We purchased a 4-gallon collapsible water container prior to the hike because we were a bit worried about how convenient the one natural spring would be to our campsite. Turns out it is super conveniently located and only a short walk from every campsite (maybe a 15 minute walk, max). So we probably didn’t actually need it but it was pretty convenient for washing dishes and for making our morning coffee. The compost toilets in the campground are actually really nice and not at all stinky. They are conveniently located and well stocked with toilet paper (no need to bring your own). For the most part, we prepared for this hike exactly the way we prepare for every multi-day trek; backpacking tent, 2 sleeping bags, 2 sleeping pads, 2 inflatable pillows, lightweight cookware, onions, peppers, carrots, 3 pasta-ish meals… you get the point. We were also sure to bring twine to hang our food and garbage from a tree as we’d heard that the squirrels there are tiny terrors. And as it turns out, the rumors are true. We had our garbage rummaged through and our poor neighbors had a backpack chewed through. 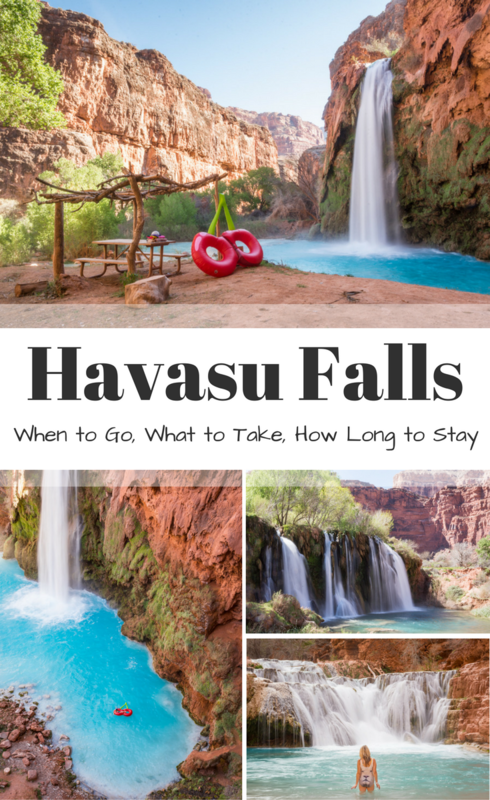 You can find our complete guide to packing for Havasu Falls here. 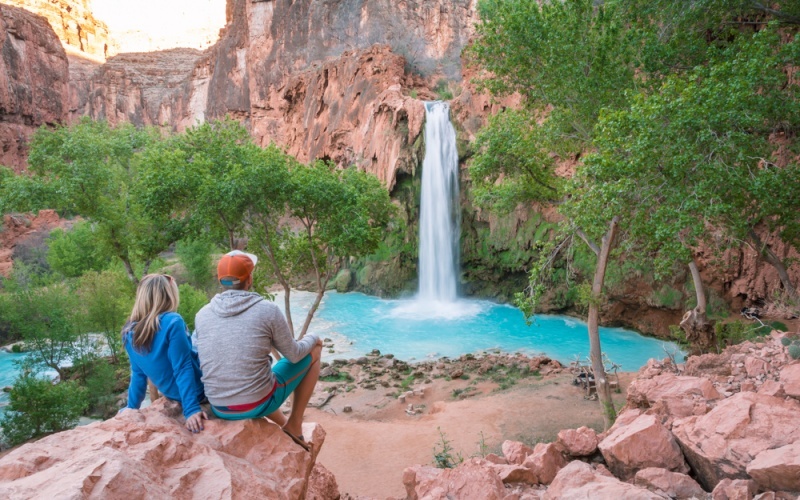 Honestly, no matter how many days you stay at Havasu Falls it will never feel like enough. You can make it as relaxing or adventurous as you want. We made the most of every day. We arrived to the trailhead really early and started our hike in around 8:30am, arrived by 12:00pm, spent the afternoon swimming above Little Navajo Falls, and the evening enjoying Havasu Falls. We were up on day 2 at 7:00am to get an early start hiking out to Beaver Falls. We stopped a lot along the way for photos and then had the falls all to ourselves for an hour or so before the crowd arrived. Day 3 we made our coffee by Havasu Falls and then locked down an ideal picnic table and lounged in our giant cherry floaty for most of the afternoon. Day 4 we were back to the swimming holes around Little Navajo Falls and then had lunch in the village and started our trek back around 3:30pm. It was a nice mix of strenuous activity and relaxation and was absolutely the perfect vacation. Got questions? Want more info? We’re happy to share everything we got! Hit us up in the comments or email us at howdy@wanderingwheatleys.com. Wow – this looks absolutely amazing! I would love to go there! Adding this to my list! Thank you for all the details. Some friends & I are planning to go in 2019. When i hiked the narrows I got a single permit with 4 people. Do you know what is the max number of people on one single permit for this one? Thanks so much for reading our blog! The water temperature was fine in March – cold, but it feels great when you’re in the sun. The downside of going early (or late) in the season is that the floor of the canyon doesn’t get as many hours of sun. So you really only get to enjoy the water from 9am until about 4pm. If you go in the middle of summer you’ll have much more sun at the base of the falls. 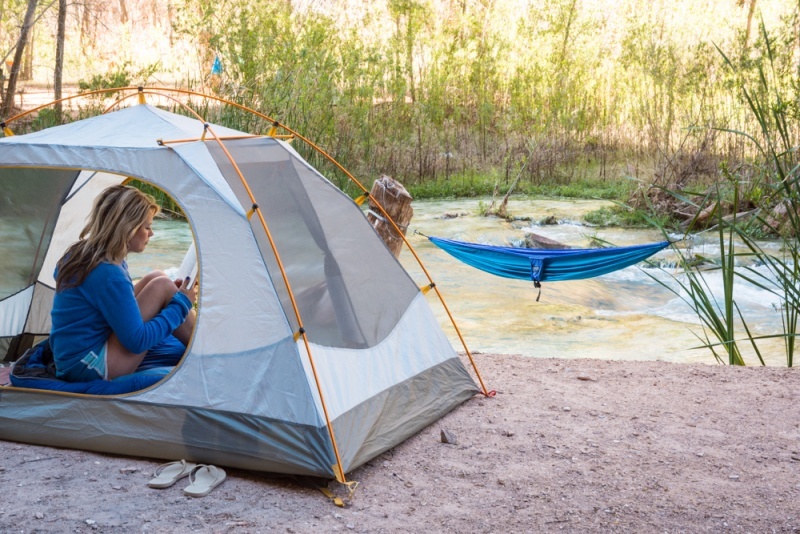 The downside is that it’s much, much hotter – both for the hike in and while you’re around your campsite. They crowds are about the same all season because of popularity of Havasu Falls and the limits of the reservation system. 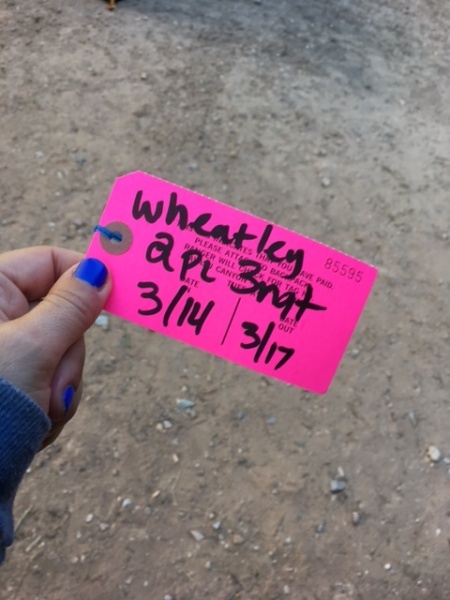 There are ~300 permits issued each day and they are pretty much all spoken for the entire season. I think July would be almost unbearably hot for the hike in and out. If you do go in the middle of summer make sure you do the hiking part very early in the morning or late in the afternoon. PS. Your Instagram is rad! Keep up the good work! Awesome information but I do have a question about how to get a permit and those facebook pages. I being trying to het a permit for 3-4 years now I started when you needed to call all day, never got an answer and after it was on the web site after 10m everything was booked (rediculest) and this year totally forgot the day (that on is on me)… But few of my friends got tickets or permits with strangers in facebook that there party couldn’t make it or cancel so how this works or how we can check that it is a legitimate pass because I don’t want to get ripoff but I really want to make it this year. Thank you for your time in advance and thanks again for your fabulous post. i guess you would need to be good shape to this ??? Hi Lynn, It’s a pretty long hike (10 miles) in and out so yes I would say you need to be in good shape. 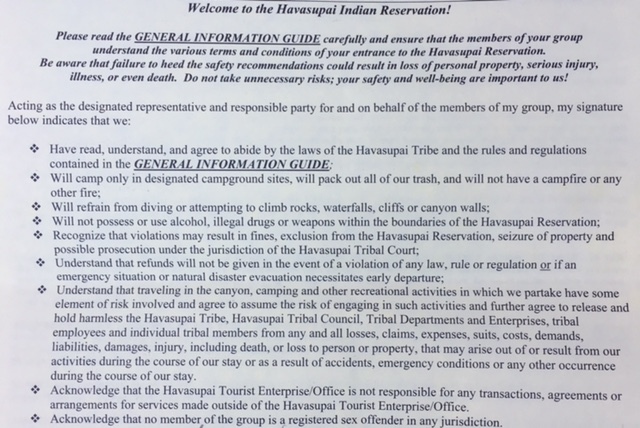 You can pay to take a helicopter in and out of the reservation, but you’ll still have to hike the last 2 miles yourself.